Students will be able to write and tell time on the half hour using an analog clock. Show students an analog clock set on the hour. Ask the students to identify the time. 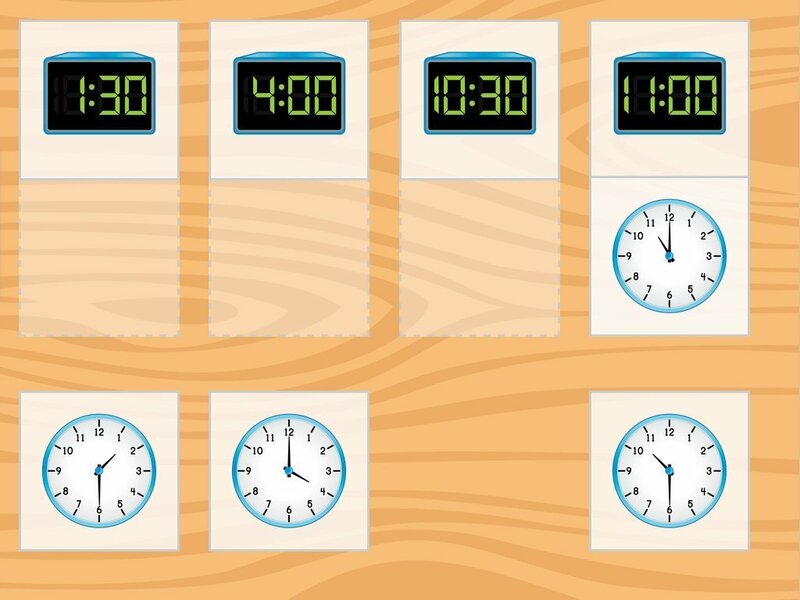 Tell students that one hour can be split in half to create a Half hour. Draw a whole pepperoni pizza on the whiteboard. Ask the students how they would share this pizza between two people. Reiterate that in order to share the pizza equally with two people, it must be cut in half equally. Draw a dashed line vertically down the middle of the pizza. Draw an analog clock next to the pizza. Ask the students to count from 1 to 12 as you write the numbers on the clock. Place the Hour hand, or the shorter hand, on the clock half way between 1 and 2. Place the Minute hand, or the longer hand, on the clock directly pointing at 6. 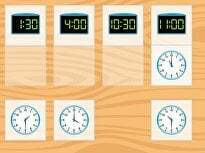 Tell the students that the minute hand is always on the 6 for the half hour. Tell the students that the clock says one thirty. Tell the students that one thirty is between 1 o'clock and 2 o'clock. Demonstrate on an analog clock what 1 o'clock, one thirty, and 2 o'clock look like. Ask the students what two thirty looks like. Continue around the clock until all half hours have been demonstrated. Provide the students with a white precut circle of construction paper that has a dashed line halfway through the circle. Ask the students to colour one half of the circle red. Ask the students to colour over that same half of the circle yellow. Provide the students will precut small red circles and glue. Have the students glue the red circles on top of the colored half of the circle. Tell students they have created half of a pizza. Give students plastic or paper clock manipulatives. Write the following times (10:30, 4:30, 6:30, 2:30, and 12:30) on the whiteboard one at a time. Call out the time, and ask the students to show the time on their clocks. Walk around the classroom observing the time on each student's clock. 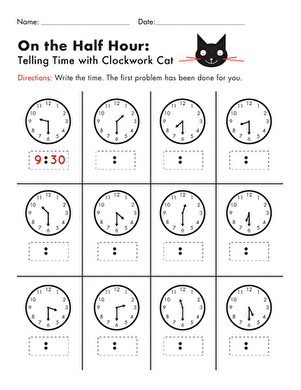 Give each student the On The Half Hour: Telling Time With Malcolm Mouse worksheet. Enrichment:Provide students with the Time to the Half Hour (IV) worksheet. Support:Provide students with the Draw the Half Hour worksheet. The minute hand is already on 6. 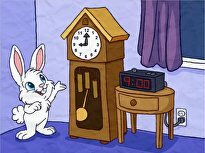 Instruct your students to draw the missing hour hand on each clock. Randomly give each student a time on the half hour. Ask the student to show it on the clock. Ask the student to write the same time on a sheet of paper. Give immediate feedback to the student. 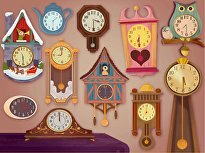 Ask the students to verbally give examples of telling time on the half hour. 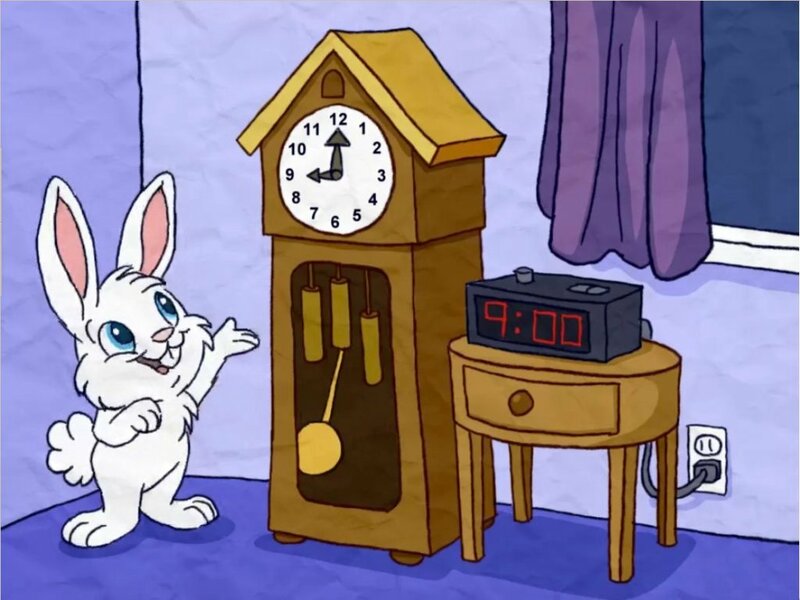 Help young Malcolm Mouse learn how to tell time on the half hour by circling the time shown on each clock. Kids must tell time to the hour and half-hour. 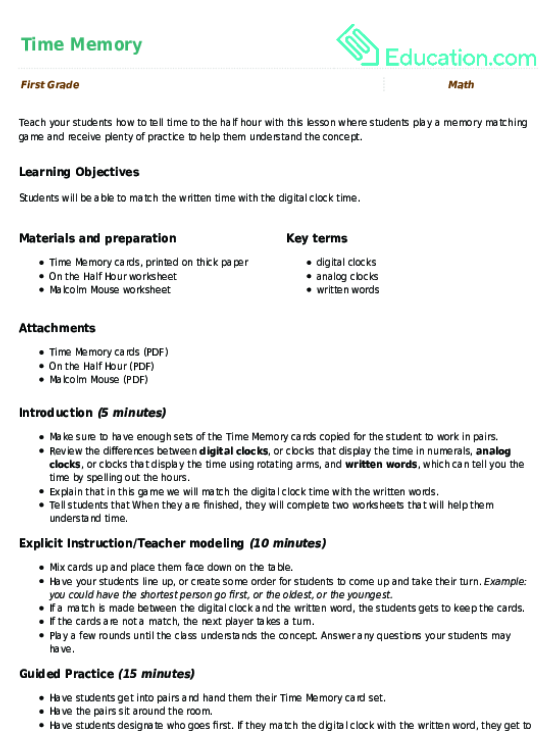 This fun concentration game gives students practise with telling time to the hour and half hour while matching analog and digital clock faces.